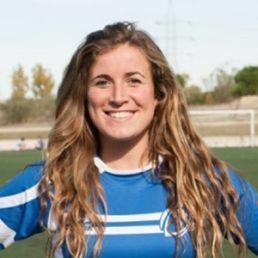 Isabel Rico Vázquez (Talavera de la Reina, 1987) teacher of physical education and captain of the Spanish national rugby team. From a very Young age I was a keen athlete, I played several individual sports such as athletics. It was after university when I decided to give rugby a try, an absolute revelation. The first time I played with the national team was in 2012. Since then, I have been able to achieve several victories with ‘Las Leonas’ and also with my rugby club ‘Olímpico de Pozuelo’. I also had the opportunity to play with the Wasps back when I lived in England. This March I had the privilege to be called by the Barbarians, becoming the first Spaniard to join their team. I think climate change is the main issue of the millennium. We must be aware of the power that we human beings have in accelerating this process with our every-day actions, which impact at a global level. I believe it is crucial to make society aware of the consequences of our daily actions in ecosystems and global warming, and the alarming scientific data gathered regarding the issue.